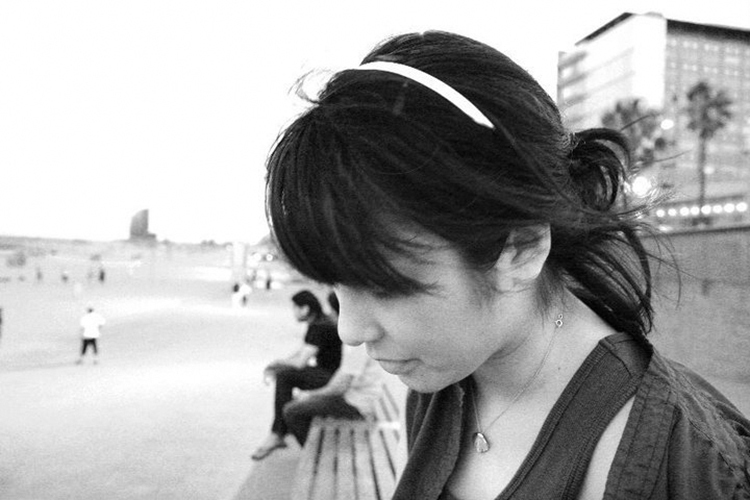 Kumiko Ide holds two distinguished titles: 1) Digital Strategist at Tribal DDB and 2) My First Virtual Friend. The former means she comes up with webtastic ideas for clients like the Canadian Tourism Commission, the latter means I met her through Twitter. 1. Part of my job is to stay on top of emerging trends in the digital space. I try to do most of my reading electronically, but somehow there’s always a stack of new research and reports on my desk at any given time. 2. 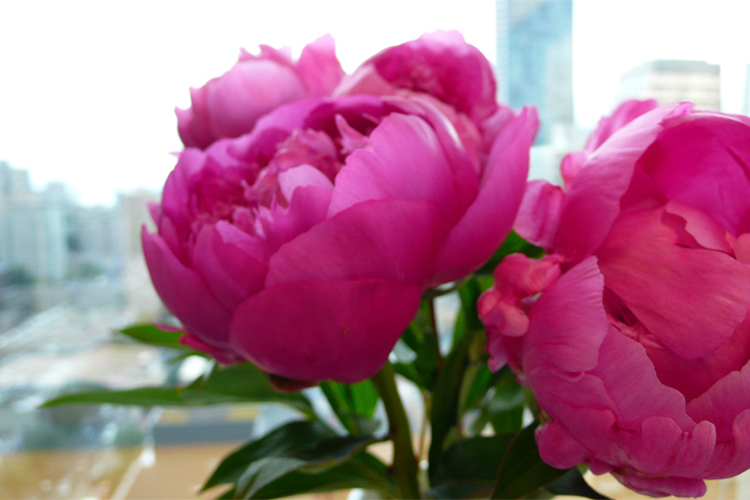 There’s a great little flower stand on West Pender – they had these beautiful pink peonies the other day, and I couldn’t resist. I also love Queensberry Flower Company, which is located in the Granville Skytrain Station; they make the most charming little arrangements and I never leave empty-handed. 3. 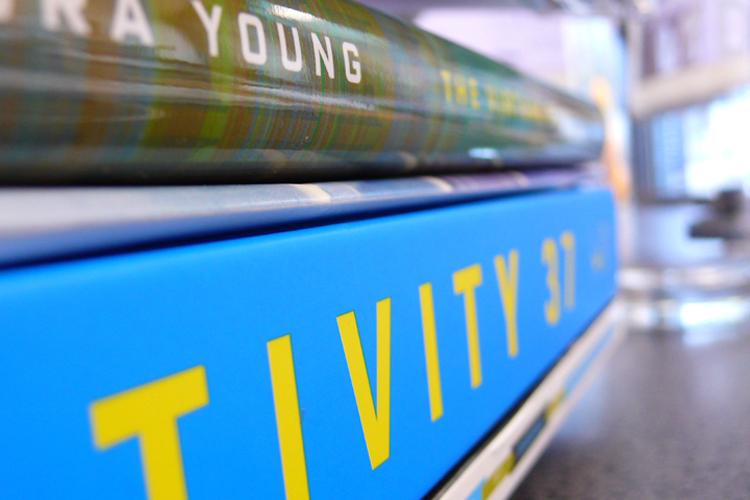 Even before I worked at an advertising agency, I enjoyed going through typography and design books. 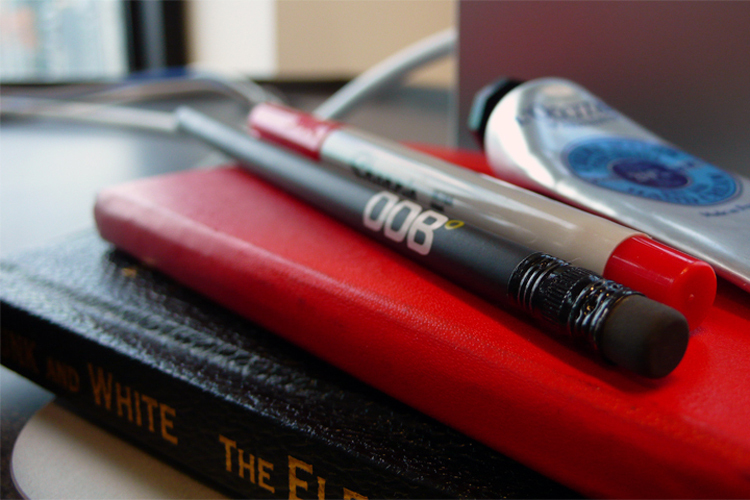 Because DDB’s a full-service agency, I now have access to a large library of creative resources – not just digital. Kid. Candy Store. 4. On those crazy busy days when we don’t get a chance to eat lunch or have to stay late, it helps to have snacks around to tie us over. 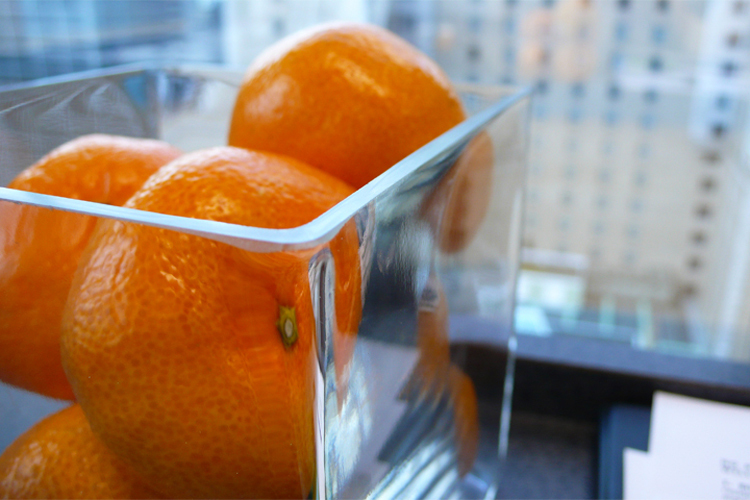 Also, I’m on a crazy mandarin orange kick right now. 5. I usually have at least one Moleskine on hand for sketching out ideas and jotting down notes in meetings. The red one here is my day planner (I’ve kept a day planner since I was in my early teens – I’m resisting the transition to an electronic calendar because I am an old lady and I am set in my ways). 6. 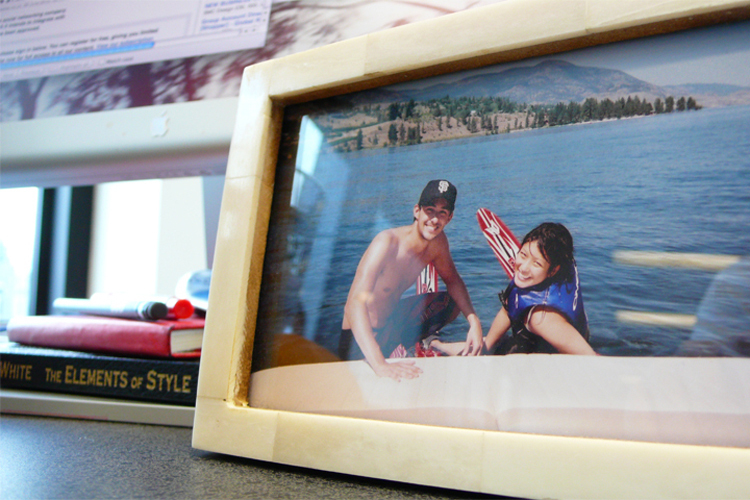 I’m not a hugely sentimental person, but I love having this one framed photo on my desk. My boyfriend’s mum had just given me some waterskiing pointers, and I’d managed to stay up for more than two seconds (hence, my massive grin. Little did I know that my entire body would ache the following day). 7. I am the worst about sunset photos. I need to learn how to better enjoy the moment – instead of whipping out my iPhone. But when that’s my view at the office, can you blame me? P.S. Whip out your iPhone and follow Kumiko on Twitter, Tumblr and probably some other social network you haven’t heard of yet. P.P.S. Check out the first post in the Workspace column and find out how Niki Blasina of A Haute Mess smells when she blogs. And click through the second post to find out where Anya Georgijevic of I’m the It Girl started her footwear obsession. 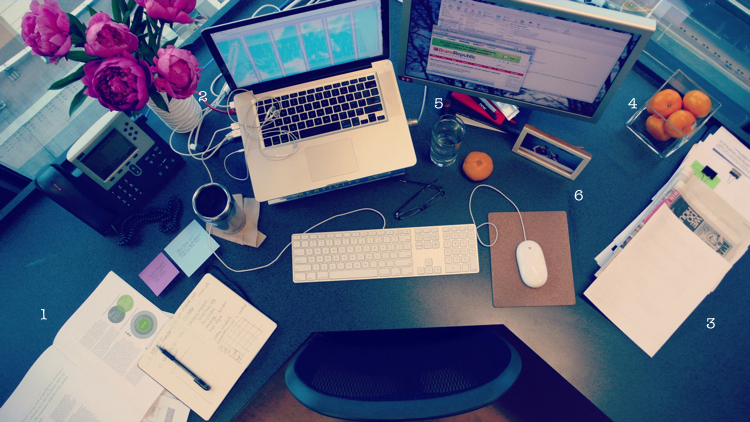 wow what a beautiful workspace! 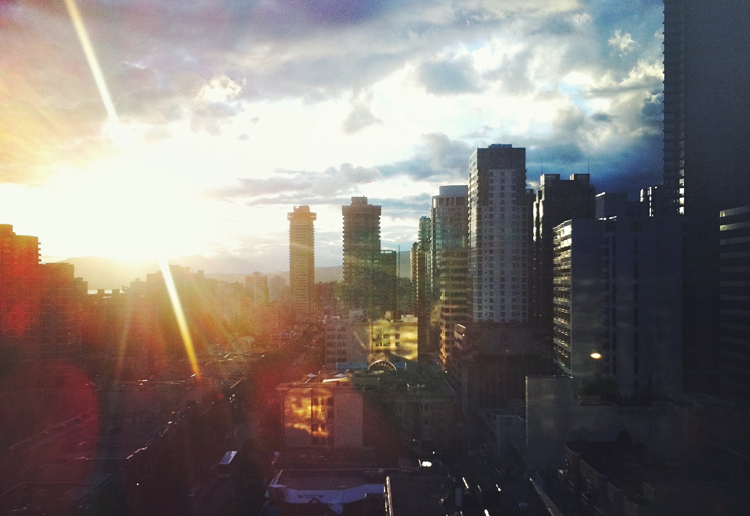 i love that photo of vancouver. Stunning, isn’t it? My view isn’t nearly as beautiful!